“Pied Beauty” is a prayer to imperfection. 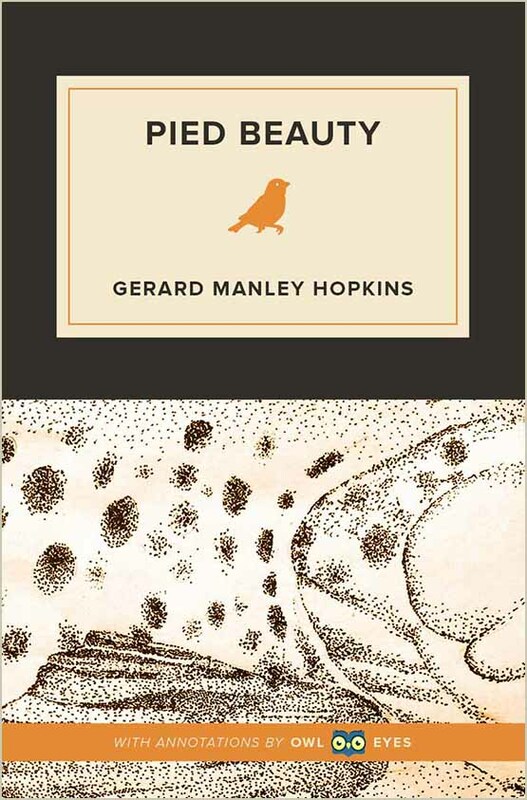 Written by the poet, Greek scholar, and Jesuit priest Gerard Manley Hopkins in 1877, the poem reconsiders the nature of beauty. With the opening line, “Glory be to God for dappled things,” Hopkins takes a fresh look at the world and finds beauty in unexpected places. Things that are textured, variegated, messy, and even lowly become magnificent to the poet’s eye. The pattern of pied beauty comes to outweigh the specific objects. The images blend together through Hopkins’s surprising use of metaphor—clusters of fallen chestnuts are like “fresh-firecoal.” The poem is a testament to Hopkins’s signature approach to sound. At times, the poem veers into startling rhythms, and its language is laced throughout with rich rhymes, alliterations and consonances. The poem’s formal originality proves its own point. The poem itself is one of the beautiful “dappled things” it praises. Owl Eyes is an improved reading and annotating experience for classrooms, book clubs, and literature lovers. Find full texts with expert analysis in our extensive library.